Our teams trained more than 40 people to use the KoomBook and to develop a digital library. Libraries Without Borders and the French Alliance of Bangui have been collaborating since March 2017 on a project to create digital libraries in Central African Republic. With help from our KoomBook kits, this project aims to create digital libraries in 8 education facilities such as the French Alliance of Bangui ; the Ecole Normale Supérieure of Bangui ; the Faculties of Health Sciences Economics and Management ; the Bangui University Library ; the Central African Agency for Professional Training and Employment ; the Regional Education Centers in Bangui and the Mbaïki Regional Education Centers. Group of trainees learning to manage the KoomBook in Central African Republic. 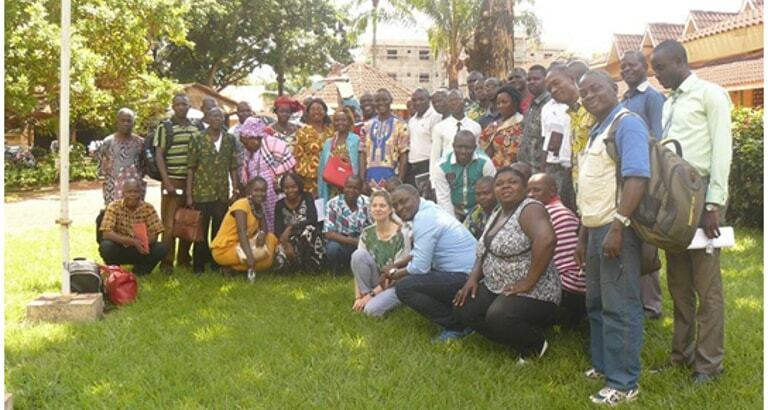 In July 2017, Prisca Berroche and Maurice Mayimkibiza, Project Manager and Coordinator of Regional Programs at LWB respectively, went to Bangui, Central African Republic, to facilitate the first training session alongside representatives of the 8 chosen facilities. This training session was the first step of the digital libraries project. A time for assessment, Q&A sessions and debate between participants and trainers. 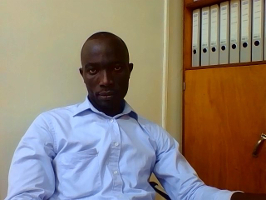 An interview with Innocent William, Technical Manager of the project in Central African Republic. Innocent, a computer engineer responsable for computer hardware and IT classes at the French Alliance of Bangui, is in charge of all digital library projects in Central African Republic. What is the overall objective of the French Alliance in Bangui? Is there a specific goal for this project? The French Alliance works to promote French language in CAR. 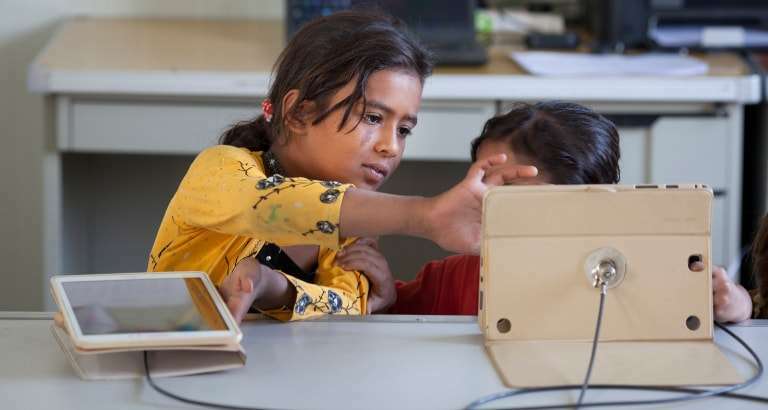 Thanks to the Koombook, the French Alliance is supporting education efforts, of both children and adults, by popularising digital libraries and their use. The French Alliance is the epicenter of the project, having mobilized different operational partners and visiting the country’s universities alongside the Central African Republic’s Ministry of Education. How did the partnership between LWBLWB and the French Alliance of Bangui originate? In 2016, the Director of the French Alliance of Bangui, Mr. François Grosjean, decided to launch a project to develop online libraries in Central African Republic. In fact, there are no digital libraries in our country so we immediately contacted LWB. After several meetings, we decided to launch the project together. What does this collaboration consist of today? Today, with Director Olivier Colin, the French Alliance is a part of numerous collaborations with different actors. As a matter of fact, each partner develops their own digital library and the French Alliance is the link between LWB and these actors. LWB has the expertise and they provide guidance, advice, technical tools, framework and training. Could you describe the training part of the project? What were some activities carried out during the training session? We tried carrying out several activities. The training session allowed us to approach the technicality of the KoomBook, its management, the facilitation and the follow-up aspects of the project. For example, we taught project participants how to transfer content from e-books, smart phones and laptops. We also put activity and monitoring sheets at their disposal. How did the participants invest themselves in the training session? The activities went well, with a high rate of participation. Participants intervened, reacted, etc. Some also requested to go over parts of the training session, urging LWB to return in a few months for a follow-up and to evaluate the digital libraries. Can you describe to the experience of a group leader after having undergone training? Prisca is project manager for the French Alliance of Bangui digital library project. She participated in training sessions and was very satisfied. She told me that she found it very interesting because it allowed her to facilitate activities for the digital library for children and adults. She continues to develop content that will be made available in the KoomBook. Until now, many of the books she had available were out of date. The Koombook, with its impact as a digital learning tool, will solve this problem by providing access to current, up to date learning materials. No, not really. Our main challenge today is working in partnership with other organizations to diversify the content we offer. What was one of the great successes of your projects in partnership with LWB? One of the main successes of our partnership with LWB was the development of lessons that were then integrated into both the 8 KoomBooks and school teachers’ e-books. This project, conducted with the UNICEF as well as the Ministry of Education, was a huge success! Today, digital libraries, e-books and tablets are being set up across the country. Activities are also being implemented. We will keep you informed on our projects.